May 19, 2010 Dan O. Just look at that pig! How can you not love this movie!!!??! A piglet, who is won by Farmer Hoggett, is brought onto his farm to live and eventually get big and become dinner. However, Hoggett notices something special in Babe, and decides to enter him into the national sheep-dog competition, and Babe soon starts to think he is a dog himself. Listen, I know I’m going to get a lot of crap for at least reviewing a movie like this, but this is a classic, make no ands, ifs, or bigggg buts about it. A movie like Babe, doesn’t have zillions and millions of dollars for promotion and advertising behind it, but as family films go, its the perfect score. The script is written so well, mostly cause its almost like the animated film Up, and by that I mean it c0vers on everything possible so well: comedy aspect, family aspect, fun & adventure aspect, as well as being totally tearful. I laughed and almost cried so many times during this film. Its a witty script that gives these animals, an almost human feel, by adding personalities to their characters, and realism. There is a lot of great themes about animal cruelty which I’am totally without a doubt against, prejudice, family, and overall life, and never backing down from the biggest odds. All themes hit so well in a film about a talking pig, when some others can’t do that right at all. I will say that although this film filled my heart with a lot of sorrow, I did not cry. As I stated in my Top Ten Movie Facts!, I have only cried at three movies, and this came so darn close to pulling those heart strings just enough to shed a tear. But me being the big, machismo man that I’am, did not fall victim to the heart that is within Babe (Yes, I’am proud of this). Also, there’s plenty of other good things to this film. The rural area that it’s filmed at is beautiful and totally makes for a great deal of great-looking scenes to add to the heart-warming appeal of the film itself. There is also another thing that this film touches well on, but never really wants to bring it out, and that is being a vegetarian. By showing these animals as more than just stupid, useless creatures that we eat, gets us thinking: maybe we shouldn’t be eating this meat after all? These are single-highhandedly the cutest things I have seen in films in a long time, so why would I want to get rid of them for food? Just after watching this and thinking about it, you never can fully look at a hamburger, or bacon the same way again. 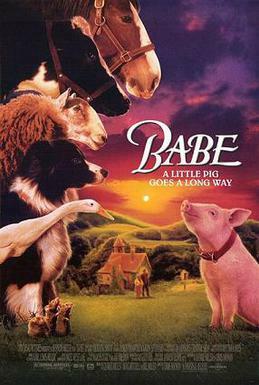 Christine Cavanaugh voices Babe, and does one of the best jobs I heard in a long time. Having a chick voice a boy pig, is just great and adds a lot more innocence, and charm that is within his character. Also, let’s not forget to mention that James Cromwell gives off a great performance here as Farmer Hoggett. You wouldn’t look for a good performance by a human in a talking pig movie, but look what he’s playing against: nothing basically. He’s joyful, enthusiastic, and we capture his enthusiasm while watching him perform. Consensus: Don’t be fooled, Babe is one of the best family fun adventures featuring, great performances and voicing, a screenplay that touches on the themes it wants to very well, and pulls a lot of heart string, while providing enough fun for the whole family. Next Finally I Made It!! Totally agree with you on this one! I used to love it when I was a kid. It’s a fim with a giant heart, great voices and some really good humor. The biggest heart in a film, that I have seen.